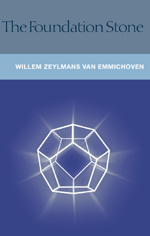 WILLEM ZEYLMANS VAN EMMICHOVEN, born in Holland in 1893, was a pupil of Rudolf Steiner. A medical doctor and founder of the Rudolf Steiner Clinic in Scheveningen, he was also General Secretary of the Anthroposophical Society in the Netherlands, in which capacity he attended the Christmas Foundation Meeting. Zeylmans also conducted important research into the influence of colours, the psychology of peoples and nations, and the psychology of the individual human being.